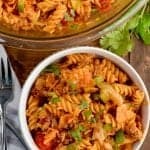 This Taco Pasta Salad is a family favorite! 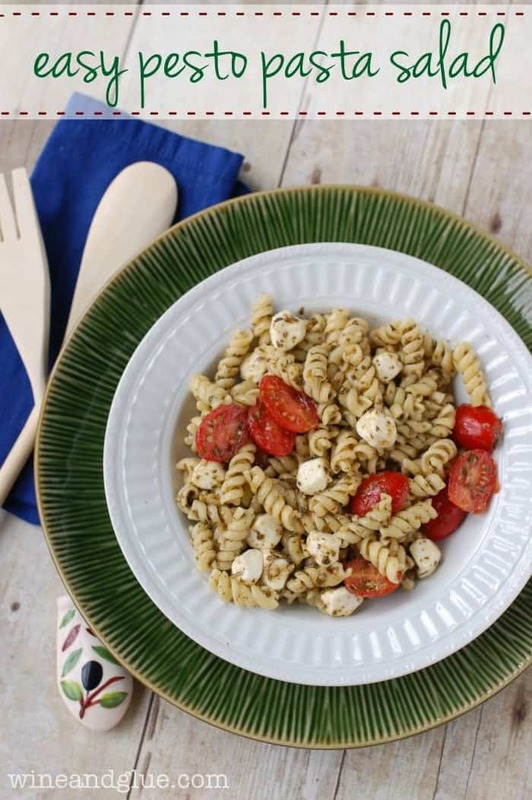 This pasta salad recipe is perfect for BBQs, potlucks and big family gatherings! It has a secret ingredient that stops everyone in their tracks! Make a bunch of BLT Ranch Burgers, a big Zucchini Sheet Cake, a huge batch of my mom’s Bacon Spinach Salad and you have the perfect menu for a big family get together. Growing up with two older brothers, I always wanted a sister. I remember one year for Christmas I actually asked my parents for a twin sister, because I was kind of a punk as a kid. They gave me a mirror. I wonder where I got my punkiness from. And then after growing up with two brothers, I married a man with FIVE. But the thing about all those brothers is that it has actually meant sisters! Seven sister in laws! Don’t tell anyone, but one of my very favorite sister in laws is the wife of the brother who is just one older than Nathan (did you follow that?). Deanna has been part of my in law family the longest, so I have known longer than almost all of my other sister in laws. She is so many awesome things, but I enjoy her most as an aunt and as a friend. She seriously loves my kids so much, it is the greatest thing to watch. And even though right now she lives on the other side of the stupid planet (remember when I made this Pina Colada Sangria for her send off?) and when I text her I’m either interrupting her breakfast or keeping her awake too late, she is one of my favorite people text with . . . I always end up cry laughing ???? So this is her recipe. She has made it for tons of family functions, and I loooooove it. I snarf it down every time she makes it. The secret ingredient to this, if you can believe it, is French dressing. I know that sounds super totally weird, but it is all the exact right flavor combos. 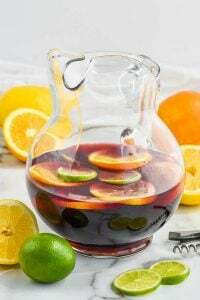 This makes a HUGE batch, so it is perfect for BBQs and family functions. You can make it ahead of time, but just wait to add the dressing and chips until right before you serve it otherwise the chips and the lettuce will get all soggy and weird. 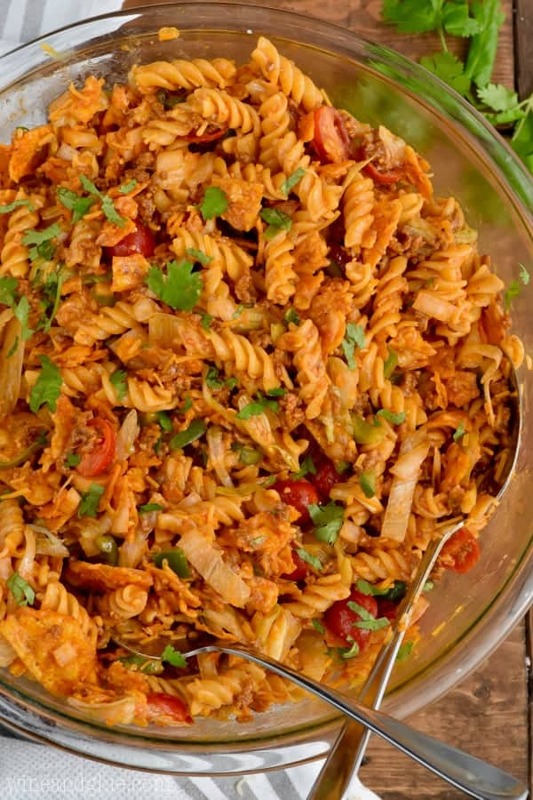 This Taco Pasta Salad is a family favorite! It's perfect for BBQs, potlucks and big family gatherings! Stir together the beef and the taco seasoning. 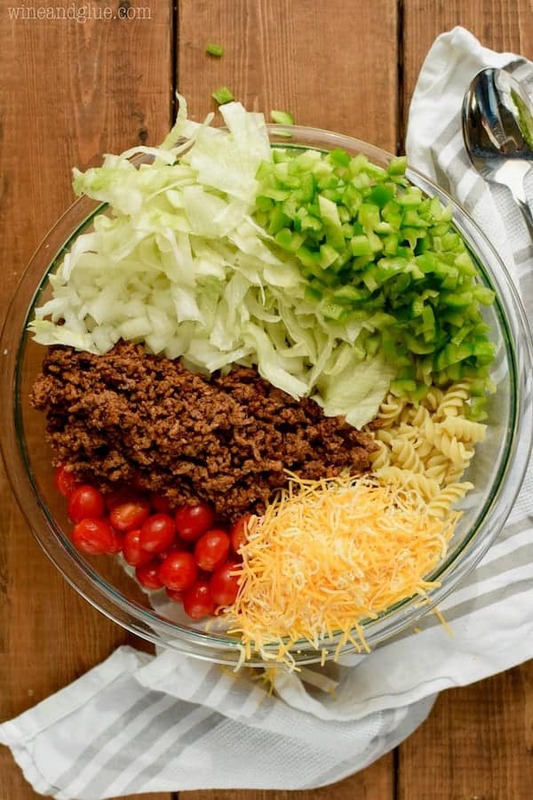 In a very large bowl, mix together the beef, noodles, green pepper, onion, tomatoes, lettuce, and cheese. Mix in the French dressing until everything is well coated. Then stir in the chips. Enjoy right away. Look delicious. For my son in laws I will have to add a few sliced jalapeno peppers or have them on the side ( on the side would be better for those you wouldn’t want the peppers in their salad) and they can add the peppers themselves . Roughly; about how many servings would this make? I would say this will give you roughly 20 servings, obviously that depends on the the size of the serving. It makes a BIG batch. I’m so so happy you liked it Chrissy! I’ve had other people use Russian, Catalina, or Southwestern Ranch. What kind of green peppers is it that you use ? I use green bell peppers or red, yellow or orange bell peppers: just what happens to be in my frig…all good, but green gives it a snap of color. I prefer it all cold, but I have heard from others that it is good both ways. Sorry to be the grammar police but my grandfather was an English teacher so these things drive me crazy….. the plural of sister in law is “sisters in law” (not sister in laws….. the sisters are multiple, not the law). Same rule for things like “secretaries of state” or “jacks in the box” or whatever. Sorry for the correction but thanks for the recipe…. looks delicious! Caroline, I appreciate good grammar as well, but seriously, is that all you took away from this delicious recipe? You don’t always have to comment – keep some things to yourself. Agreed! I am a teacher and that is the LAST thing I was paying attention to. I also AM a teacher, or at least was for many years. I have a school of thought on correcting other’s grammar. Unless you are someone’s parent or teacher, it is inherently rude to correct people. So, unless you are being intentionally rude or have been asked for advice, don’t. Even your children and students may not care to be corrected in a public forum. Completely agree! Having a husband who was born deaf- whom often does not hear words correctly and quite honestly never properly learned how to spell and two children who struggle daily with spelling. They never text anyone outside of immediate family, won’t ever post on social media, question every word written because people can’t follow the golden rule. Is the placement of an S really your business? I can guarantee- it’s not worth pointing out to make someone else. So all the commenters correcting the original grammar commenter are also being rude? Just wondering. I agree get over yourself! It was the first think I noticed. I like a taco salad with thousand island dressing too. I make mine with half and half taco sauce and Thousand Island salad dressing. Yummy! Really! Was that necessary? Rude! Do you do this cold? Or is the meat and pasta still hot when you add everything? I serve it cold! I ran the noodles under cold water to stop them from cooking, and then the beef cools off pretty quickly. Any reason to wait and add the taco seasoning after meat is cooked instead of adding to hamburger while cooking? Maybe more flavor when added after? Am making tomorrow. When I make Taco Salad I always use hot sauce and Catalina on it and love that, so this will be sooo good. Thank you. I thought it would add more flavor, and honestly, when I was making it I was making a video and it was just easier this way. You could do it both ways and I think it would be delicious. I can’t wait to try this recipe! I was wondering about how you served it too (hot or cold)…so I’m grateful I checked the comments. Thanks so much for the recipe. Has anyone tried reheating it a day or so later? Hi Kim, I really wouldn’t recommend it. It’s super delicious cold. is here something you can use instead of Spike? 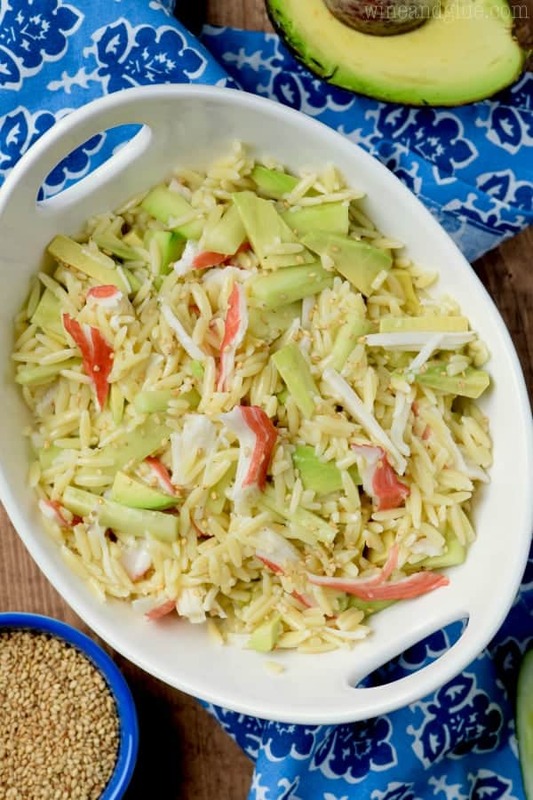 There’s no Spike in this particular recipe, but the Crab Pasta Salad has Spike. I’ve had other people have good luck with Old Bay Seasoning. OMG, I Love spike, I use the no salt version & add a little sea salt. I put that Sh!t on everything!???? Finally! Someone who knows what it is! Would you have nutritional values? Thousand Island or Catilina would work well, or just google French dressing – any recipe that has ketchup as the base would be good! I used mayo with pace chunky salsa for the dressing seeing as I didn’t want the sweetness and it turned out great. Do you add water with your homemade taco seasoning to the meat like you would if you were using a packet mix? Western dressing also works well in this. I’m making this today….I think I’ll use chopped cabbage instead of lettuce because it’s what I have and it doesn’t wilt as fast but otherwise follwing the recipe. Thanks…I really like your site. It still good, but certainly the first day is better. Catalina dressing in the taco pasta salad is alot better than the French dressing. This was delicious! I added a few drops of Tabasco to mine. You certainly could add it! Excellent recipe. If you serve the Doritos on the side instead of adding to the whole salad, the salad will be just as good the next day as the first without having soggy Doritos. Yes! Though I will add the lettuce gets a little wilted as well, so you might want to put that on the side too. I will so make this when we go back home in Aug, to meet the new great grandson. I just don’t think I can wait till then. Oh my gosh, just made this last night and it is GREAT! I found a LITEHOUSE Salsa Ranch Dressing at Safeway, do you think that would work as well ? Also the Sister in laws is just fine. THANK YOU FOR ALL THE AWESOME RECIPES.!! Sisters in law not sister in laws. You don’t have plural laws. Plural sisters. Have a great weekend Elizabeth! Funny, I didn’t even read the story until after all the comments, I was too busy drooling over the recipe. I can’t wait to try this today for a Birthday party!! 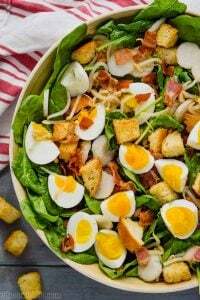 My husband is very picky and he really like this salad as our son and I did to. That’s great to hear! Thank you for the feedback Linda! Hi Ed! I haven’t done the calculations for the servings on this. Can I recommend My Fitness Pal? It’s a great app that is super easy to use and gives you the calorie output for different dishes. 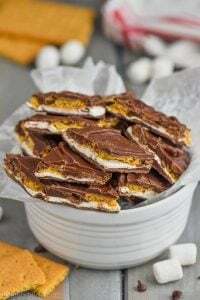 You can even enter the link for this recipe and it will pull all the ingredients and give you an approximation. I just did it for this recipe and it said 354 calories per serving if there are 20 servings. What would you suggest serving with it? I’m making a light evening meal for a few people that don’t have a lot of time to eat it as they are popping in when they aren’t judging dance events. This is such a great question, Deb! I have only really had this as a side amongst a bunch of other dishes. If you really want it to be a light meal, I would suggest just putting out a veggie tray with some hummus and ranch dips and a fruit tray. I was surprised there was lettuce in this, as I couldn’t see it from the picture. Was thinking this would be a great alternative to taco salad because it wouldn’t get soggy (and one of my girls doesn’t like lettuce salads). Do you think it would be OK without the lettuce? I think it would be just fine without the lettuce. You could also try adding the lettuce at the last minute! I made mine with Western dressing. And I also added the lettuce on the side. I figured this way I could keep the leftovers and not have soggy/wilted lettuce. It turned out great. Even my picky husband ate seconds and asked for leftovers to take for lunch the next day. This is highly unusual for him, so it really says something about how good this was! I also did a combo of green and red peppers, but that is a minor change. Now that you mention it, there is no lettuce in the salad shown in the picture. If you look at the second picture, you can see a HUGE pile of lettuce in the about 11 o’clock position. I fixed this salad for my parents’ 50th-anniversary celebration this weekend and it was a huge hit! 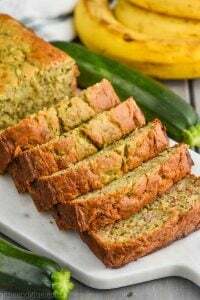 I have given out several copies of the recipe, linked folks to it on Facebook and pinned it to one of my more popular Pinterest boards. I made it with seasoned ground turkey because my dad is allergic to beef and no one questioned it. Super easy to make ahead of time–I waited and added the lettuce and Doritos right before serving. I will definitely make this again! Everyone else at it cold but my husband ate his warmed and loved it! I’m so happy to hear this, Leslie! Was looking for a recipe to make for our Cinco De Mayo potluck at work, and this is perfect! Can’t wait to try it, thanks for sharing! It looks totally awesome. Can’t wait to try it. I am making this for my high school girls’ tennis tournament, tomorrow. I have a recipe for pizza pasta and they beg me to make it each time we have a tournament. I told them I was making something different and they cried until I showed them the photo! Stay tuned! I added corn and left out the Doritos. I also used turkey and gluten free noodles. It was great kids loved it a lot! I made this tonight and my husband just loves loves it!!! Thank you for the recipe. So glad to hear it Vicki! I grew up eating this with 3 changes. 1) no noodles…it was specifically a salad 2) Tostitos or Fritos instead of Doritos 3) western dressing instead of French. I’m very excited to try it with pasta. I need to make several batches of this for a school luncheon. Can I make the noodles and beef 2 days in advance? Two days might be pushing it a tiny bit. I probably would do it the day before only, but it will probably be okay. Hi. I’m making this for Memorial Day tomorrow and I follow a recipe to a T bc I’m kitchen illiterate. lol I noticed that the recipe says for taco seasoning, 1oz or 4 TBLS., but 4 TBLS is actually 2oz, so I was wondering if it’s actually 4 or 2 ounces? I have been making this taco salad for over 10 years but I use Italian dressing. I also never put pasta in it. I am definitely trying that next. When I go to parties I am always asked to make taco salad. Everyone loves it. I have made it so much that I don’t eat it anymore. Lol. I did use Catalina dressing one time and it wasn’t a big hit so I went back to the Italian dressing. Definitely not good reheated or if it sits too long. I have never used noodles, but I have made Taco salad the sauce I always use is 1 jar of taco sauce and equal amount of Helmans mayo and plain tortilla chips crushed. Very good. This looks amazing! 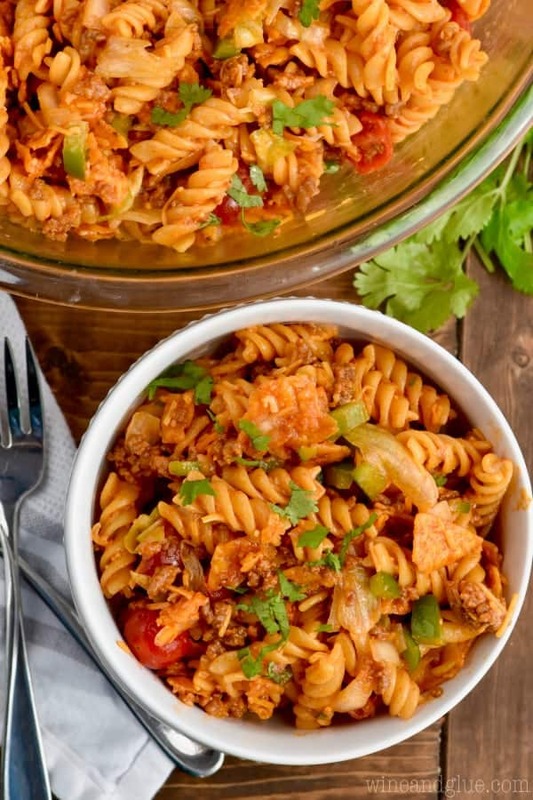 It combines two of my favorites, pasta and taco salad. I look forward to making it soon. Thanks for sharing the recipe. I hope you like it Thomas! This is great! Had to share something funny – I thought the recipe sounded yummy so I copied it over to Word and printed it out. Then I read a couple of the comments, about different dressings, so I added that to my version and printed it out. I read a couple more comments, about mayo and chunky salsa, so I added a “note” to mine and printed it out. Read more and added a note about serving the lettuce and chips on the side, and printed it out. Went back and read ALL the rest of the comments – added a note about optional corn and black beans. Printed it out. Now I’m putting all the previously printed-out sheets in the recycling bin. Yeah, guess I could have been smarter. But I got a good laugh out of it. I would think that if you left the chips out until you got your plate, it would keep better, so you wouldn’t have soggy chips the next day. Fabulous, was easy to make and absolutely delicious . This will be apart of family dinners.Thank you for sharing. Have you ever tried to make it with chicken instead of beef. Just wondering if it would be as good? I haven’t! I think it would be good. You might a lose a little flavor, but if your family doesn’t eat beef that or ground turkey (with a little more fat) would be a good substitution. Use Catalina salad dressing instead of French. Much better! What can you use instead of french dressing. So glad to hear Rhonda! I would like to post this one! Where do I do that? This looks very good…..but, we make a vegetarian Taco Salad when we have gatherings. 2 cans kidney beans, 2 cans olives (sliced), a couple of tomatoes, 1 avocado, couple of tbsp salsa, (All mixed together in large bowl. 1 head of lettuce on top,2 cups of sharp cheddar cheese on top of .lettuce. Do not mix yet….Right before people eat, crumple Doritos Nacho cheese chips and put on top of cheese. Mix with 3/4 bottle-1 full bottle of Zesty Italian Dressing and stir. Great for potlucks, and you don’t miss the meat one bit. Do you mix water in with the meat and taco mix? I found this recipe on face book and made it for dinner one night. I wasn’t sure if this recipe was a meal or a salad but it was a meal and then some being it makes a lot. This was a big hit the first time I made it and very simple. I wasn’t sure about the french dressing but was brought up to never stick your nose up until you try it. This is one of the best and have made it many times since. The only thing I do different is add the Doritos as you eat the salad because they do get soggy, but a great recipe. I made this tonight for my grandkids and husband for Taco Tuesday. I used ground turkey instead of beef. I added the onions in as i Cooked the meat too. I have never had French dressing before as i am not a fan of salad. Everyone loved it including me. I will definitely make this for my next party gathering. Very good recipe. Thanks for sharing. Had this about 30 years ago for the first time. FF to 2017 , know ones believed me about the pasta in a taco salad!!! It was so yummy. They used thousand island dressing.. going to make this soon for my family???? Could I substitute green chilies for the green peppers? Thanks! I think that would be a delicious twist! 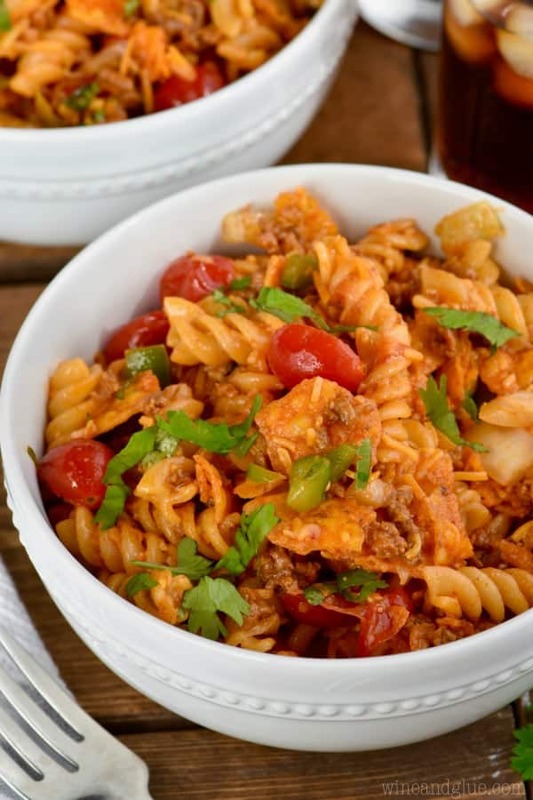 Lisa, I Love the recipe… I have always made something similar but without the pasta. I do like your recipe for a good change. Just to add some different flavor I do like to mix Catalina Dressing and some mild salsa together (mix evenly together) for the dressing. This is NOT trying to say anything negative about yours, I DO think yours is just Fine as you had wrote. I find it kind of funny that a taco salad uses French dressing. I’m not making a comment on the quality or taste of the salad, just the irony of the ingredients. Very good , can you freeze this? 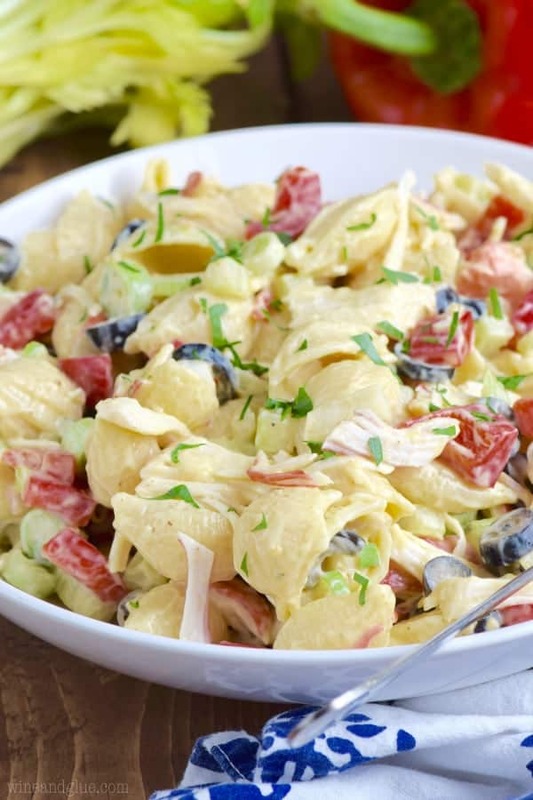 Making this for fourth of july celebration, I am mixing french and catalina dressing and adding olives to recipe. Leaving lettace and dorito chips for the moment before we start serving food. My mouth has been watering since seeing this I cannot wait. Made this for a bbq and everyone loved it! It was very yummy! Thank you! Would a whole batch be too big for a house of four adults? How big of a box of noodles makes a pound??? Hi Riley, you are looking for a box of uncooked noodles that says 16 ounces or 1 pound on it.